CUT-STACK 150 contains 3 different active substances: Testosterone Propionate: 50mg Drostanolone Propionate: 50mg Trenbolone Acetate: 50mg CUT-STACK 150 is an excellent pre-contest STACK. 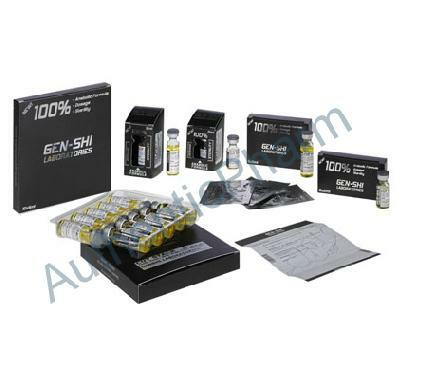 Testosterone Propionate is a fast acting testosterone which gives you all the major benefits of the longer acting ?�?�?�????tests?�?�?�?????????? but with significantly less water retention. It also clears the body relatively quickly (levels peaking after 24-36 hrs with a 3 day active life) making it the testosterone of choice for drug-tested athletes. CUT STACK also contains 50mg Drostanolone Propionate (Masteron). This is a DHT derivative which is fast acting and quickly broken down. It has the benefit of being immune from aromatization (conversion to estrogen) therefore water retention and fat deposition do not present themselves as issues to be dealt with. Since it is a strong androgenic it assists training strength and aggression ?�?�?�??????�?? which can often be lacking in dieting athletes. It also produces a noticeable increase in muscle density and hardness ?�?�?�??????�?? attributes necessary come contest time. The final ingredient in ?�?�?�????CUT-STACK?�?�?�?????????? is Trenbolone Acetate. This is a highly anabolic substance and provides the ?�?�?�??? ?missing link?�?�?�?????????? when it comes to quality gains. Many athletes who use testosterone only cycles fail to maximize their muscle growth due to the imbalance between androgens and anabolic substances. When highly androgenic, moderate/low anabolic substances are used exclusively there is a tendency to develop tendon and ligament damage due to reduced collagen synthesis. Trenbolone also exhibits anti-estrogenic properties due to its unique chemical structure and its ability to completely occupy the estrogen receptor. Athletes also benefit from Trenbolone's ability to shuttle nutrients into muscle highly efficiently leading to extremely high quality muscle gains. Side Effects Susceptible individuals may experience acne, hair loss, increased aggression associated with steroid use. However, when used properly this formula is relatively easy on the liver and should prove more tolerable to the system than some ?�?�?�????home-made?�?�?�?????????? STACKs. The effective dosage for CUT-STACK 150 (as recommended by the manufacturers) is 150-300mg every 1 ?�?�?�??????�?? 3 days.